First, let’s establish what sleep training is. Even among sleep training experts and pediatricians, families will find different definitions. Here at Baby Sleep Trainer, sleep training means a child knows how to go down into a completely empty crib with no sleep props whatsoever (including pacifiers, swaddles, crib positioners, etc. ), and being able to go from being 100% awake to 100% asleep with no assistance from parents or sleep props whatsoever. From there, in order for a child to be fully sleep trained, they need to be sleeping through the night, with whatever the number of feedings the pediatrician says are necessary, and taking the appropriate number of naps for their age group during the day. What Age Should You Start Sleep Training? Now that we know what sleep training is, how does baby sleep training work? First, we want to make sure that sleep training doesn’t start before the appropriate age. I recommend parents consider sleep training anytime baby is 16 weeks of age or older. 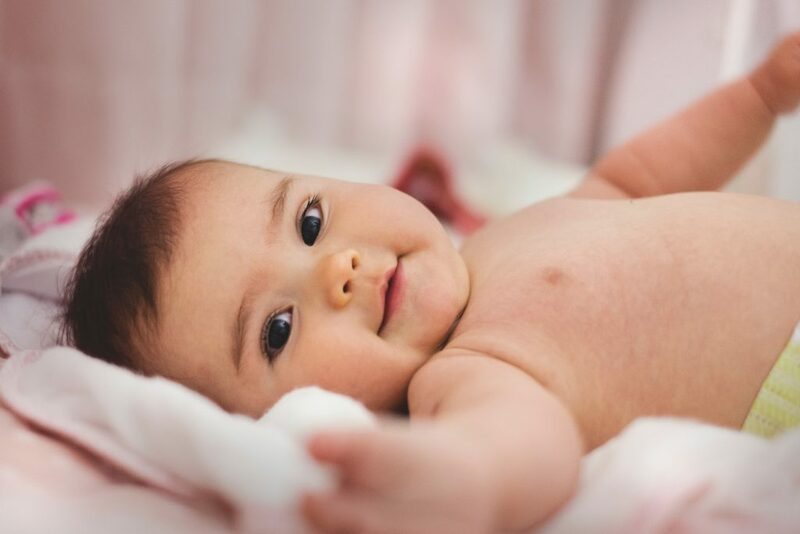 If your child is a newborn, there are many ways to help your baby get the sleep they need without undergoing the official sleep training process. Once your baby is the appropriate age, it’s a good idea to take some time to identify the different methodologies available. In my opinion, all forms of sleep training are actually cry it out (CIO). What I mean by that is that all forms of sleep training require a child to learn how to fall asleep independently, which typically leads to some kind of protesting from baby (ie. crying). And they need to fall asleep independently so that they are able to put themselves back to sleep when they wake overnight, which is totally normal for all humans to do. That’s why it’s vital that a child know how to put themselves to sleep at naps and bedtime – so that they can put themselves back to sleep during normal nocturnal arousals. When a parent removes whatever their child’s sleep prop is that they need in order to fall asleep, so that they may learn to fall asleep on their own, children will express their frustration by crying. While a parent can interact with and check on or comfort their crying baby during this learning process, what they cannot do is arbitrarily limit the amount of time the child is allowed to express their frustration before they’re able to figure out how to fall asleep on their own. Many parents conflate the term CIO with extinction CIO. I want to be clear that sleep training does not require extinction CIO (extinction CIO: no checks, typically for the 12 hour overnight period) in order to successfully sleep train. All methods of sleep training vary in their level of interaction. Your child’s temperament should be your guide in deciding how hands-on or hands-off a sleep training approach you decide to take. Once you’ve identified the correct method, you want to make sure you have a solid plan in place, hopefully with strong hands-on support. Even with a very descriptive written outline or book, parents very often find they fail sleep training because every child reacts differently to any given set of sleep training guidelines. It is impossible to go through the sleep training process without one, or likely many questions arising about what to do at any given time through the process. If you make the wrong choice, your child will cry more, and it will take longer to reach your sleep training goals (if you reach them at all). Thankfully, I have created affordable, online programs to help guide you through the process of sleep training, making sure to include a ton of hands-on support from me to guide you through the process. I created these programs after working with over 4,000 families around the world and I’m grateful for the opportunity to share my expertise with you and be able to guide you through the training process. Learn more about the Baby Sleep Trainer Programs! You’re Ready to Sleep Train! Once you have a solid plan, with adequate follow up support, in place, then you are ready to sleep train your baby! I recommend you begin at bedtime, plan to stay 100% at home for the first few days of the process (so that your child can learn how to fall asleep on their own for naps as well as bedtime), and then remember that sleep training generally takes about 1-2 weeks. Remaining very consistent through the process is vital, and giving your child the time and space to acquire and hone their new skills is important. Have a sound understanding of what sleep training is. Make sure your child is the appropriate age to start sleep training. Decide upon what type of method, and which method exactly, you’ll be following. Ensure you have a detailed plan, hopefully with adequate follow up support, in place before starting. Be prepared to remain consistent for the first 1-2 weeks of the sleep training process. If you have any questions about how to get started with the sleep training process, please don’t hesitate to reach out. Sweet dreams, and remember that healthy sleep for you and baby is probably much closer than you think.